Strontium is a soft, silver-yellow, alkaline-earth metal. It has three allotropic crystalline forms and in its physical and chemical properties it is similar to calcium and barium. Strontium reacts vigorously with water and quickly tarnishes in air, so it must be stored out of contact with air and water. Due to its extreme reactivity to air, this element always naturally occurs combined with other elements and compounds. Finely powdered strontium metal will ignite spontaneously in air to produce both strontium oxide and strontium nitride. Most of the strontium produced today is used in the manufacture of color television picture tubes. It is also used to refine zinc and is combined with iron to make magnets. Strontium has uses similar to those of calcium and barium, but it is rarely employed because of its higher cost. Principal uses of strontium compounds are in pyrotechnics, for the brilliant reds in fireworks and warning flares and in greases. A little is used as a getter in vacuum tubes to remove the last traces of air. Most strontium is used as the carbonate in special glass for television screens and visual display units. Although strontium-90 is a dangerously radioactive isotope, it is a useful by-product of nuclear reactors from whose spent fuel is extracted. Its high-energy radiation can be used to generate an electric current, and for this reason it can be used in space vehicles, remote weather stations and navigation buoys. 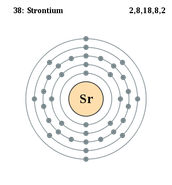 Strontium is commonly occurs in nature, forming about 0.034% of all igneous rock and in the form of the sulfate mineral celestite (SrSO4) and the carbonate strontianite (SrCO3). Celestite occurs frequently in sedimentary deposits of sufficient size, thus the development of mining facilities attractive. The main mining areas are UK, Mexico, Turkey and Spain. World production of strontium ores is about 140.000 tonnes per year from an unassessed total of reserves. 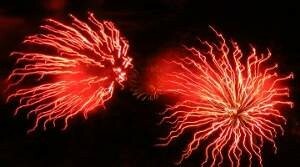 Two strontium compounds, strontium carbonate (SrCO3) and strontium nitrate (Sr(NO3)2), burn with a bright, red flame and are used in fireworks and signal flares. Strontium carbonate is also used to make certain kinds of glass and is the base material for making most other strontium compounds. Strontium-90, a radioactive isotope of strontium, is a common product of nuclear explosions. It has a half-life of about 28.8 years and decays into yttrium-90 through beta decay. Strontium-90 is especially deadly since it has a relatively long half-life, is strongly radioactive and is absorbed by the body, where it accumulates in the skeletal system. The radiation affects the production of new blood cells, which eventually leads to death. Lenntech. Alumni from the Technical University of Delft, 1993. Web. n.d. Web. 15 Dec. 2014. 2014. Web. 16 Dec. 2014. McMhon, Jeff. "Radioactive Strontium Found in Hilo, Hawaii Milk." Frobes. Jeff McMhon, 27 Apr. 2011. Web. 16 Dec. 2014.